The temptations of Hollywood impact on a filmmaker's relationship. There is no development or analysis of human relations here, the camera simply observes, with this subjective, fractured approach precluding empathy; it’s like being buttonholed by a lovelorn drunk in the toilets of a nightclub. Having been a part of various scenes and happenings myself, I’m all in favour of cliques and sets, especially of the driven and creative kind. However, while like-minded support is invaluable, a common hazard with artistic coteries is that their insular nature can result in films which are so scenester specific, so tailored to the shared experience which contributed to their creation, that they risk excluding any audience beyond their production’s immediate circle. A case in point is writer/director/star/producer Josh Evans’ vainglorious 39 - a film by an indie film maker who lives in Hollywood, about an indie film maker who operates in Hollywood, and which concerns the film maker’s efforts to make an indie film while his relationship ignobly dissolves due to the fringe temptations of Hollywood. In fairness, at this last point, plot wise, the comparisons do diversify, as Evans’ real-life marriage to L.A. goth singer Roxy Saint is four years strong: Saint’s music features in the film, and she also stars, as the film that Adam (Evans’ character) is making centres on her band. Meanwhile, Robert Wagner pops up as Adam’s father; perhaps as a favour to daughter Natasha Gregson Wagner, who plays Adam’s travailed wife? Evans clearly has access to an interesting cast - the performances are good throughout, and, when the actors are given something more stimulating to do than the sub mumblecore articulations of independence and love, it’s clear that the cast (vets of low budget indies) have aptitude beyond the shallow tableaux on offer here. Advances in digital technology render night time Hollywood a neon wonderland of soft ambers and amethyst, dazzling Adam and drawing him further into its promise of sybaritic pleasures. The film looks good, and narratively, the cessation of Adam and Tabatha’s relationship is related in an ambitiously non-linear fashion; interspersing the good times with the challenging, while peppering the narrative with Adam’s infidelities and his encouraging chats with dear old dad (Robert Wagner is a damn pro throughout, albeit looking slightly perturbed, maybe even a bit miffed. I love you Robert Wagner!). What’s lacking is a sense of story, and any justification as to why we should care about these particular people and their personal break up. Honestly, I’m not really all that interested when my dearest friends tell me of relationship problems, so as to worrying over Adam - a struggling artist privileged enough to have his own lawyer, ‘in the family’ throughout Adam’s life, organising divorce settlements - I think I’ll elect to save my carefully practised, faux looks of concern where they can do the most ostensible good. A rom com in reverse, 39 sees the deconstruction of a union, rather than the hard won consolidation of love, and with scarce lightness of tone or touch in the telling. There is no development or analysis of human relations here, the camera simply observes, with this subjective, fractured approach precluding empathy; it’s like being buttonholed by a lovelorn drunk in the toilets of a nightclub. Cinema Omphaloskepsis at its most ponderous, we drift through mottled non-causal scenes, such as Adam and his mate picking up a couple of girls, vividly lit hotel rooms, Adam buying a gun. This last vignette causes a liberal crisis, with one of the lads hand wringing over the morality of such a purchase. It’s alright mate, just don’t use it to shoot anyone: stop making a fuss over every little thing. It is scenes like the one detailed above, shot in a real life gun shop with what seems to be an actual shop worker, which prove to be both the most interesting aspect of 39 and also its major complication. The cinema vérité style portrays Hollywood as a living breathing place, here both alluring and somehow tangible, but the location also unwittingly serves to remind us of 39’s provenance: another aspirant product of a Hollywood indie scene. 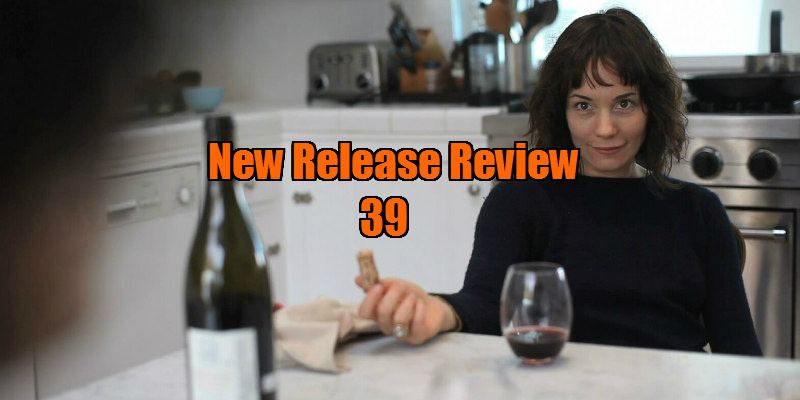 39 is on DVD and VOD now.